Everybody knows somebody who wants to see Miss Representation! 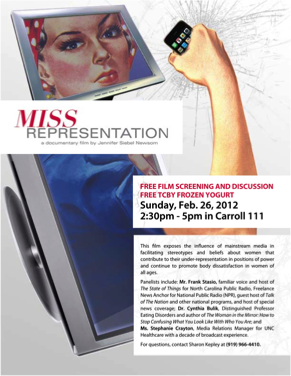 On Sunday, February 26th, 2012, UNC Eating Disorders Program is hosting a FREE screening of “Miss Representation” in Carroll Hall 111, as part of National Eating Disorders Awareness Week. Described by viewers as “an inspiring call to action,” “thought-provoking, and “time changing,” Miss Representation, written and directed by Jennifer Siebel Newsom, was premiered at the 2011 Sundance Film Festival, aired on the Oprah Winfrey Network (OWN), and has been viewed by more than one million people world-wide. Our own Dr. Christine Peat wrote a spectacular review http://bit.ly/vKCx7Q, adding to the long-list of glowing accolades. Revealing the misrepresentation of women in the media, this powerful documentary exposes media’s influence in perpetuating negative beliefs about women in power, often preventing them from reaching higher and more respected leadership positions in the United States. By screening “Miss Representation,” the UNC Eating Disorders Program hopes to enhance medial literacy, encourage healthy advertising skepticism, increase general awareness about society’s influence in shaping the persistent “glass ceiling,” promoting body dissatisfaction, and eroding the self-confidence among women of all ages. Following the screening, audience members will enjoy lively discussion with a panel of exceptional activists including Mr. Frank Stasio, familiar voice and host of The State of Things for North Carolina Public Radio, Freelance News Anchor for National Public Radio (NPR), and guest host of Talk of The Nation; Dr. Cynthia Bulik, Distinguished Professor Eating Disorders and Nutrition and author of The Woman in the Mirror: How to Stop Confusing What You Look Like With Who You Are; and Ms. Stephanie Crayton, Media Relations Manager for UNC Healthcare with a decade of broadcast experience. Enjoy FREE frozen yogurt, compliments of tcby. Join UNC to raise awareness about eating disorders during NEDAwareness Week! Event Details, click HERE.